The Weird and Wonderful World of Corporate Merchandise. It’s a tried and tested way of raising brand awareness. Whether it’s a low budget ‘give-away’ at an exhibition or a high value corporate gift for a select customer, promotional products are designed to keep your company’s name in front of customers and prospects. Take a look around your desk right now. The chances are you have at least one promotional pen close at hand. In fact 92% of respondents to a branded merchandise survey had at least one branded product on their desk, and nearly half of those asked had more than four. There’s no denying that corporate merchandise is a powerful marketing tool, but what are the ingredients for a successful promotional product? In another survey, the top three criteria were listed as quality, memorability and usefulness. Let’s face it, your average pen or desk calendar isn’t going to tick the ‘memorable’ box, so we thought we’d share our favourite weird and wonderful corporate gifts. With single use plastic becoming a serious ‘no, no’, we are all being encouraged to take reusable cups to our favourite coffee shops. Waitrose are now only serving free coffee to customers with their own cups and most other popular outlets are offering discounts for customers bringing their own reusable cups. That’s why we think you can’t go wrong with an eco-friendly reusable cup. We love these bamboo mugs and these eco coffee mugs. They’re certainly good quality and very useful – if you remember to take yours with you next time you pop out for a coffee! The recent craze for fidget spinners may have run its course, but most of us have a work colleague who struggles to sit still. And we hate to break it to you, but if you can’t think who the fidgeter in your office is, then it’s probably you! The good news is, studies show that fidgeting has health benefits. It increases blood flow and burns calories. Maybe that’s why the multi-function fidget pen is proving popular? This innovative fidget spinner comes with a ball pen and touch screen stylus at one end, and an LED light at the other. We’re not entirely sure what the light is for, but one thing’s for certain – your brand will be highly visible as there are four possible areas on which to print it! We could never dismiss promotional pens entirely, and that’s because, even though we live in a digital age, we all still need to write things down. Most of us have a favourite ‘go-to’ pen – one that’s elegant, easy to hold and writes like a dream. And that’s just what the Contour pen is. Which is probably why Contours are the best selling pen in the industry. They are available as a standard ballpen, or a ballpen with a highlighter or stylus. And new for 2018 (drumroll please! )…you can now include a logo that lights up on the barrel. The light is activated by a push button, which is ideal if the pen is in the hands of one of those fidget types. Your logo will be lit up constantly! The Rubik's Cube is a retro puzzle with staying power. Not only can it now claim to have entertained generations, but because it's interactive (and highly addictive) it’s a gift that your customers are likely to keep hold of – quite literally! 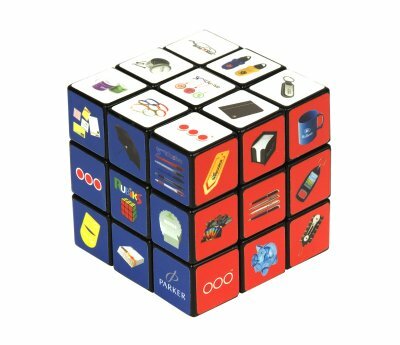 These Rubik’s Cubes are fully customisable with your logo and branding printed onto all six sides. It’s a fantastic corporate gift – with a twist! A promotional garden cup is a great way of flaunting your brand by bringing the outdoors into the office. This quirky piece of promotional merchandise encourages your customers to a grow plant on their desk, which will hopefully thrive (just add water! ), and attract lots of positive attention. The plant grows in an attractive ribbed coffee cup that is filled with soil coins and there are a variety of plants to choose from – there’s even a promotional Christmas tree (decorations aren’t included)! This jigsaw style puzzle comes as a piece of flat foam that needs to be assembled into a 3D cube. It’s extremely lightweight which makes it easy to transport or post and each side of the cube is customisable, meaning your brand is always fully on show. There are 6 levels of difficulty to choose from, with level 1 being the easiest and level 6 being the hardest. Offering something interactive is a great way to get people talking about your brand! Popsockets are described as ‘little lifesavers’ and we can’t agree more. These pop-sockety little devices attach to the back of your mobile phone making it easier to hold and use single handedly. They also help prop your phone up, when you need a stand. When you consider how long we all spend on our phones, then any corporate merchandise that can be used with a mobile has got to be a winner! We think every desk needs a Mop Topper Phone Stand. It’s an all-in-one stress reliever/ phone stand/ screen cleaner. It's certainly one of the most useful corporate merchandise products on the market and has fantastic desk presence due to its funny face and mop of hair. What’s more your company logo can be branded at the bottom so it’s still fully visible when a phone is in place. These are just a taster of some of the quirky corporate gifts that can be used to help promote your brand to customers and prospects. We’ve got plenty more ideas up our sleeve, so why not give us a call and see what else we suggest to get your brand the recognition it deserves.